I’ve been a photographer of mountains for far longer than I’ve been a photographer of track and field athletics. I have also been lucky enough to spend time in the Italian Dolomites almost every year since 1987, often on more than one occasion a year. I have literally thousands of pictures of these mountains, and from that collection I’ve selected a few I personally like. Almost all of these pictures were taken on film (remember film?). There are many, many more I need to scan to digital form when I get time. Like my own memories of the place, these photographs have become a jumble of images over time. Neither of the galleries are sorted in any particular order. That’s really down to me being a bit lazy, I’m afraid. My Dolomites photos were shot on a miscellany of cameras, ranging from a little Rollei 35 to a 6x7 Bronica. Very few indeed in the first two galleries here were shot on a digital camera and I’m in the process of rebuilding some of my archives with digital versions from more recent visits. However, I can’t ever hope to cover all of the old ground. There’s too many places I’ve not yet visited, for a start! Most of these shots are “my personal favourites”. However, if forced to pick out my top choices, they’d be (for very different reasons) the “red hat” shot, and the photo of me sitting reading the “Gazzetta Dello Sport” on the top of the Kesselkogel. The latter was taken on my camera, though not by me (of course). I often carried around a copy of the newspaper to read in quiet moments. Click to see the photographs in Gallery 3. 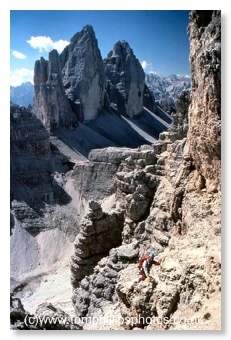 These days I'm just not finding enough time to visit the Dolomites, and need to work on that! If you are also interested in the Dolomites, please visit my other web site, devoted to The Great Dolomite Road It’s a labour of love that has been very well received. It’s also a project that I think will never actually be “finished”! I also occasionally blog the story behind some of my Dolomites photographs, and others from elsewhere I’ve visited, at “A Blog on a Landscape” . There have recently been several instances when photos from my Dolomites galleries have been gathered into Pinterest collections. From there, they have been cropped to exclude my logo, and then passed off in other online media as the work of others. If this happens once more, I will be replacing the galleries with copies of the photos with a much more intrusive logo, specifically to deter those who want to claim my work as their own. Sorry to everyone else that it will make the photos less easy to enjoy.